On Sunday, October 10, I read an obituary in the Washington Post for the poet Carolyn Kizer. She said poems do not come from ideas but from snapshots tucked in the back of the brain. I went on to read that she went to Sarah Lawrence College and I realized she would have been my mother's classmate. 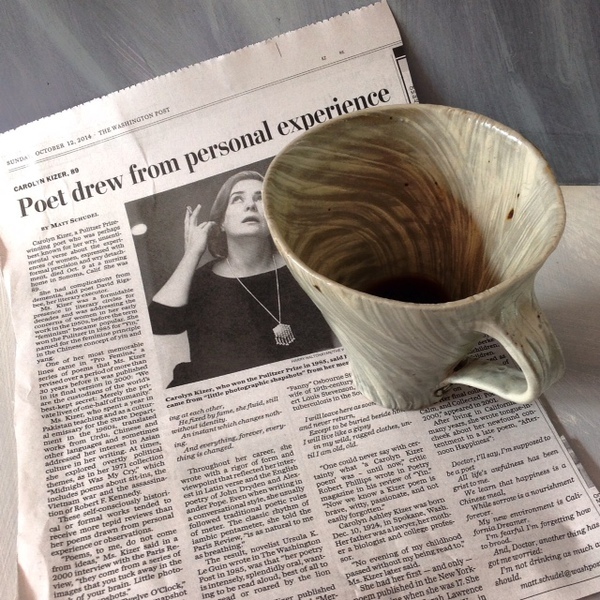 I took a snapshot of my coffee and newspaper as my breakfast poem. Part of our nourishment is sorrow and part is dreaming of dessert. I mix it with the memory of my mother's love of words and clippings, post cards and reading aloud. My writing often comes during moments of drinking coffee when I pause and look for reflection in the handmade object. The mix of the snapshot taken of cup on the table with a horizon line plus the fragrance of coffee or mint tea along with the given light and temperature of the day all lend texture to the cup as I bring it to my lips for a poetic second. This is how I make my art. I make these cups that hold moments and days and years. I have books of photos dedicated to a given cup in new light with different angles. There are my sketchbooks devoted to images of mugs. The cups are a way to focus. The snapshot moment is an accumulation of details: the place I sit, the view I see, the season I absorb. All add to the mood. This aesthetic moment can happen anywhere. It can happen on my dock, in the car, on my red chair, or during a slow dog walk. It can be an artistic flash with a paper cup in an unusual place. Or the mundane carryout paper version at the 7/11 convenience store when I am too tired to think or look. So I focus on cups, on coffee, on words, and the complex mix as I find my stance--all to say here I am; I claim this day. I declare this particular view depressing or inspiring. I drank coffee the morning after the death of my father; in yesterday's afternoon to gain perspective on memory of my mother; at a meeting with my daughter at an outdoor café in grey Philadelphia. Each cup differs in shape, surface, and poetic content. I write about coffee cups and how and when I drink my coffee because I think of cups as being representative of the basis of my work. It is an elemental portion of what I do and how I hope to affect a larger public in a very private way. If I can articulate these intimate moments of aesthetic merit perhaps I can infect another person with the idea that we can make choices in our ordinary moments of living so they add up to a rich life. This page is an archive of entries from October 2014 listed from newest to oldest.